« Cincinnati Bearcats defeat Missouri Tigers 78-63, will face UConn Saturday in D.C.
Pitt's Gilbert Brown missed a free throw with 1.4 seconds left that could have beaten Butler. Photo by Mike Frandsen. This was March Madness with a surprise ending. Butler did it again. Eighth-seeded Butler shocked top-seeded Pitt 71-70 in an NCAA Southeast Region tournament game Saturday night that featured a bizarre ending, with each team giving the other one a chance to win it on free throws in the final seconds. 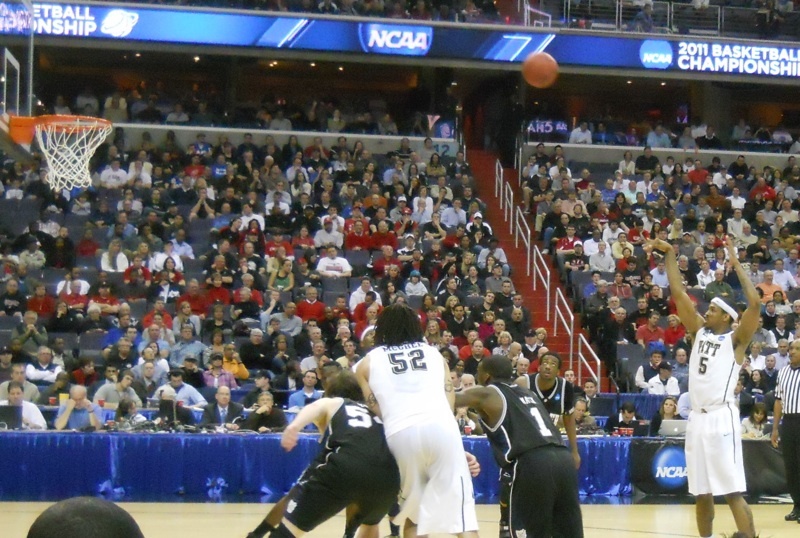 Shelvin Mack scored 30 points for Butler, but it was a free throw by Matt Howard with 0.8 of a second remaining that provided the difference for the Bulldogs over the Big East regular season champion Panthers in front of 18,684 at the Verizon Center in Washington, D.C.
Howard was the hero in the opening round, giving Butler a win over Old Dominion by scoring a last second layup. This time it appeared that it was teammate Andrew Smith’s turn to score the game’s final points. With 9.2 seconds remaining and Pitt leading 69-68, the Panthers were called for a shot clock violation. After each team called timeout, Mack passed the ball to Shawn Vanzant, who threw the ball into Smith in the lane. The 6-11 sophomore center then banked the ball in off the right side of the glass for a layup to give Butler a 70-69 lead. With each team out of timeouts, Pitt senior forward Gilbert Brown caught a pass near midcourt along the left sideline. With 1.4 seconds remaining, Mack inexplicably fouled Brown, bumping him in the shoulder. Brown made the first shot, but having a chance to win the game, his second shot rolled off the rim, leaving the score tied at 70. Howard grabbed the rebound and tossed the ball toward the basket. Somehow, Nasir Robinson reached up and made contact with Howard, fouling him with 0.8 of a second to go. An eerie mix of cheers and gasps filled the Verizon Center as the crowd realized what had just happened. Butler would have a chance to win in regulation instead of going to overtime. Howard calmly sank the free throw for Butler, and intentionally missed the second, giving the Bulldogs an improbable 71-70 upset victory, unlikely because of the way it ended. Butler (25-9), one year removed from playing in the National Championship game, was going back to the Sweet 16. Pitt (28-6), picked by many to win the tournament, was bitterly disappointed and headed home. This entry was posted on March 20, 2011 at 9:16 pm and is filed under College Basketball, Examiner.com. You can follow any responses to this entry through the RSS 2.0 feed. Responses are currently closed, but you can trackback from your own site.